– A professional pharmacy should have a logo which is their main identifier in a crowded market place. The pharmacy logo should help to convey the right message in itself (clean, professional, health orientated). It is vital that the brand or logo is used consistently across all marketing materials such as leaflets and websites and also ‘In-Pharmacy’ items such as signage and posters etc. This will help customers recognise the Pharmacy brand across multiple formats and helps build trust and confidence with the Pharmacy. Therefore the leaflet should follow this brand identity – or if limited marketing collateral has been produced and its a new pharmacy – a good leaflet designer should be able to help establish a look & feel in a leaflet which could be rolled out across other marketing items for that Pharmacy. In this leaflet design for Carters Chemist the layout is broken up into visual chunks to make it easy for the eye to scan the leaflet and move from section to section. Various graphic devices (strong benefit-led headlines, icons and imagery) help the reader scan the leaflet for key services that will entice customers and finally strong and clear contact details are shown on both leaflet sides to make is very easy for a customer to take action and use the Pharmacies services. #5. Colour can provoke feelings in people – so choose wisely! – It’s always important to brand a Pharmacy in the correct colour scheme. As the image you want to convey is one of trustworthiness, cleanliness and professionalism – you’ll find the best colours to use are blues, white, and possibly greens. Professions like Dentists also need to convey the same image. – Every leaflet design should have an end result in mind – and more often than not it’s to call a number or visit a website. In the case of pharmacies, it’s also to find and visit the Pharmacy – so an address is paramount and a simplified map is also a good idea if leaflets are to be distributed far and wide. Also remember to include Opening Hours. Here are many different kind so folded leaflet – the most popular and cost-effective folded leaflet for Pharmacies is the 4 page or 6 page letter. Well I hope you have found that blog post on tips for Pharmacy leaflet useful. 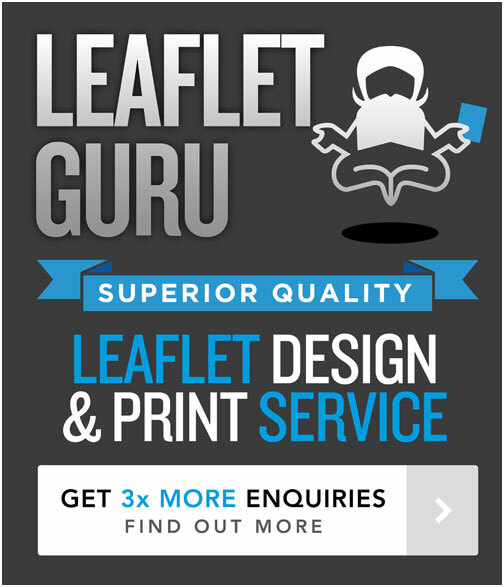 I have personally designed a lot of leaflets for Pharmacies and know exactly what works to appeal to customers, head over to www.leafletguru.co.uk if you would like to find out more about my leaflet design & print service.